Railroads are often a good barometer for the health of the economy. When the economy is performing well, demand for goods usually increases which in turn leads to higher shipment of products. Demand usually deceases when the economy slows. With gross domestic product expected to be between 2% to 3% over the next few years, railroads are likely to see growth in car loads and revenue. 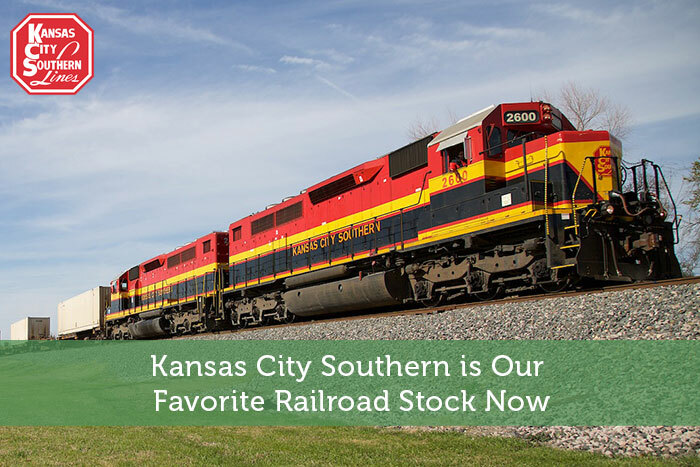 Among our favorite railroad stocks, Kansas City Southern (KSU) is our top choice. Founded in the late 1880s, Kansas City Southern initially connected Kansas City, MO and Port Arthur, TX. This north-south running railroad ranges from the Midwest and southern United States to Mexico and the Gulf of Mexico, covering nearly 6,700 miles of track. Kansas City Southern had $2.6 billion in sales last year. Sales were split almost evenly between the U.S. and Mexico. The railroad has a current market cap of $9.8 billion. Kansas City Southern reported financial results for the third quarter on October 19th. Source: Kansas City Southern’s Third Quarter Presentation, slide 5. 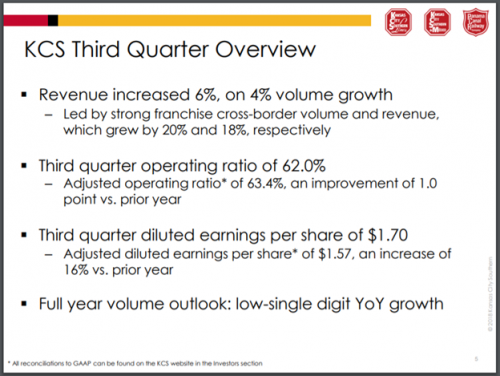 Kansas City Southern had adjusted earnings-per-share (EPS) of $1.57. This was in-line with analysts were looking for and a 16.3% increase from last year. Revenue improved 6.5% to almost $700 million. This total missed the market’s expectations by $9.2 million. Carloads increased 4% year-over-year. The company’s operation ratio improved 1%. Net fuel prices were up 17%, but were offset by a lower employee head count. Shipments for Kansas City Southern were strong in some areas and mixed in others. Source: Kansas City Southern’s Third Quarter Presentation, slide 10. Chemicals & Petroleum products saw the highest revenue growth, an increase of 17% from the previous year. Much of this growth was driven by a 15% increase in the number of carloads. Petroleum sales were higher by 36%. Refined product shipments to Mexico were also higher during the quarter. Revenues for Automotive shipments were up 8%, growth that was split evenly between an increased number of carloads as well as higher revenue per unit. Demand for autos and trucks were strong, a positive to benefit to many of the railroad companies. Intermodal volumes increased 7%, leading to 8% revenue growth. Kansas City Southern saw a high level of truck-to-rail conversion in the third quarter. 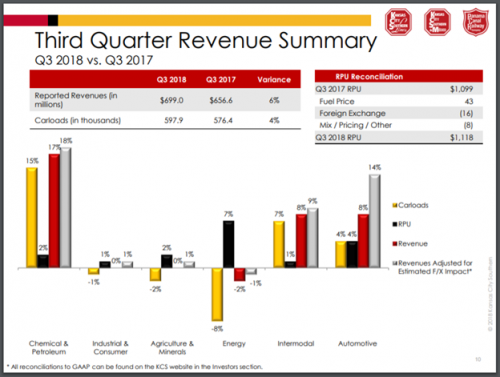 Slightly offsetting these gains for Kansas City Southern was a 2% decline in energy revenues, caused primarily by an 8% decrease in energy carloads. The main culprit for this decline was a 25% drop in utility coal. Frac sand shipments were down 35%. Revenue per unit, on the other hand, improved 7% as crude oil sales spiked more than 220%. With nearly half of revenues coming from the Mexico side of the border, a trade war between the country and the U.S. could have negatively impacted Kansas City Southern’s business. Fortunately, it appears that the two countries have come to a trade agreement. While some of the details still have to be settled, we feel that this issue has been addressed. Kansas City Southern expects to earn $6.15 per share in 2018. If achieved, this would represent a nearly 19% increase from last year. By an average of 8.6% per year over the past three years. By an average of 18.2% per year over the past five years. While the company has shown solid growth over the short and medium term, Kansas City Southern hasn’t increased its dividend since the October 2017 payment. Investors should be aware that the railroad doesn’t always follow a predicable dividend growth schedule. Kansas City Southern will pay out $1.44 in dividends-per-share in 2018. Using expected EPS for the year, this would equate to a payout ratio of 23.4%. According to Value Line, the average dividend payout ratio for the last decade is 25.9% over the life of the company’s dividend. This is one of the lowest payout ratios of all of the railroads. This should leave plenty of room for Kansas City Southern to continue paying a dividend, even if earnings were to suffer a decline. Shares of the company currently yield 1.5%, below the 2.0% yield of the S&P 500. Based off of Friday’s closing price of $96.67 and expected EPS of $6.15, shares of Kansas City Southern have a price-to-earnings ratio, or P/E, of 15.7. The railroad’s average P/E ratio from 2008 through 2017 was 22.7. This decade long average valuation is one of the highest among all stocks in the railroad sector. Shares of Kansas City Southern may not return this this average P/E, but there would still be significant multiple expansion if the stock were to be valued at 18x or 19x earnings. For comparison, the P/E ratio for the S&P 500 is 19.9. Though missing on revenue estimates, Kansas City Southern had a fairly strong third quarter. Chemicals & Petroleum, Automotive and Intermodal shipments all saw an increase in carloads and revenues. Volumes were especially strong for Chemicals & Petroleum products. Coal sales declined as demand from utility plants continues to shrink. Even though coal had a negative impact on Energy carloads, revenue per unit was higher thanks to a sizeable improvement in crude oil demand. A cooling in trade tensions between the U.S. and Mexico are also very beneficial to Kansas City Southern’s business. While Kansas City Southern has a relatively short dividend growth streak, the company has shown solid growth rates over the past three and five-year periods. In addition, the company has a very low payout ratio, one that would allow the company to continue to making payments to shareholders even if earnings were to drop. Kansas City Southern also has a current valuation that is below both its own historical average and that of the market index. The combination of all of these factors make Kansas City Southern our favorite pick in the railroad sector.